Our first attempt at growing more of our own vegetables got off to a great start when Anuradha organised four raised beds in the sunniest part of the garden. 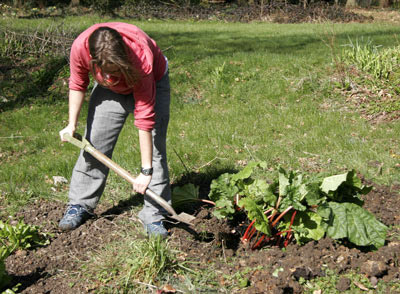 But although planting happened in the Spring and the rabbits were kept off with netting, we were defeated by the weeds. Now Franny and Adam have come to the rescue and cleared the beds, adding a thick layer of our plentiful leafmold to try and hold back the weeds. So now it’s up to us to make the best plan for planting in the Spring and then keeping our crops weed free.